Another run in the books. That makes three runs this week, and just shy of sixty-three miles logged for March. I’m a little bummed that I didn’t tackle the L.A. Marathon this year. I’ll try to remember to actually train for 2014. 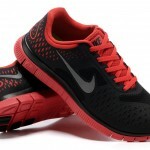 I am really happy with the pair of Nike Free 4.0 running shoes that my wife gave me for Christmas this year. It only took a couple of runs to get used to them, but now I love them. Putting on regular sneakers feels like having cinder blocks on my feet. I was really sore and tired and did not feel like running this morning. It took forever to warm up, but eventually I got in a nice groove and I was able to knock out a solid 10k, albeit a slow one.